Garmin has introduced the company's first portable head-up display (HUD) for smartphone navigation apps. It projects directions onto a transparent film on the windshield or an attached reflector lens. By providing road guidance within the driver's line of sight, HUD helps to improve safety and reduce driver distraction. 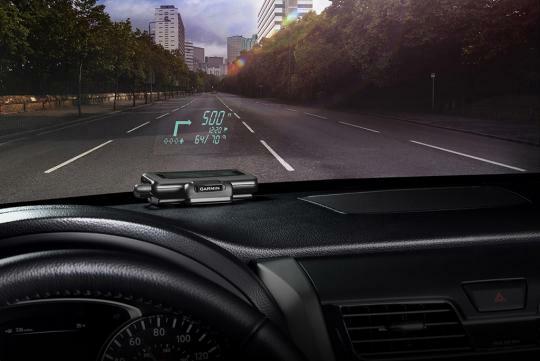 "Head-up displays currently have their place in select high end cars, but HUD makes this technology available as an aftermarket accessory for any vehicle, at an affordable price," said Dan Bartel, Garmin Vice President of Worldwide Sales. The HUD is smart enough to adjust the brightness level to ensure that projections are clearly visible in direct sunlight or at night. The system also notifies the driver when he exceeds the speed limit and informs him of the estimated time of arrival. More impressively, it also alerts the driver of the lane to be in for the next manoeuvre. Music streamed to the car stereo from the smartphone will automatically fade out during voice prompts. Garmin's HUD is priced from US$129.99 (S$166). Will the gadget itself "OVERHEATED" place on dashboard directly to sunlight during day time? Looking forward for an answer?